Across the provinces and territories, adult vaccination rates for preventable diseases like influenza, pertussis (whooping cough) and pneumococcal (pneumonia) infections are well below national immunization uptake targets of around 80 percent. 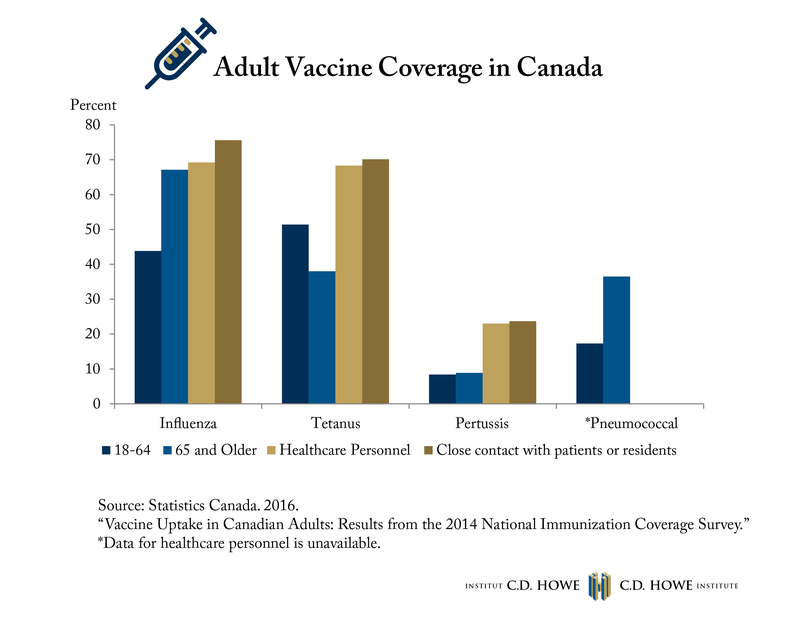 Better and more regular uptake of vaccines could improve health outcomes of Canadian adults and offset some of the economic challenges of an aging society. In this edition of Graphic Intelligence, we look at how far we need to go. As outlined in a recent C.D. Howe Institute report, the many and complex reasons for un and under-vaccination can be summarized by the `Three Cs`: confidence, complacency and convenience. Convenience speaks to the challenges – in time, energy, indirect or direct costs – involved. Despite these challenges, there are solutions; immunizing healthcare workers, building an immunization database, and asking for proof of immunization coverage at key stages in adult lives, like entry into to college or university, would all help adult immunization become a routine process.